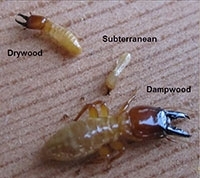 Soldier caste of drywood, subterranean and dampwood termites. Integrated pest management, or IPM, is a process you can use to solve pest problems while minimizing risks to people and the environment. IPM can be used to manage any type of pest, from urban to agricultural to natural areas. If you'd like to learn more about IPM, please come to our FREE class this Saturday, July 24th. IPM is an ecosystem-based strategy that focuses on long-term prevention of pests or their damage using a combination of techniques including biological controls, habitat manipulation, modification of cultural practices, and use of resistant varieties. Pesticides are used as a last resort and only to remove the target pest organism. Pest control is chosen and applied to minimize risks to human health, nontarget organisms, and the environment. So what is a pest? A pest is an organism that damages or interferes with our plants somehow or damages our home or other structures or impacts human or animal health. Pests may be just a nuisance or they may transmit disease. A pest can be a plant, animal, disease-causing pathogen, or any other unwanted organism that harms some part of the ecosystem. Brownish adult, yellow nymphs, and white wax of the Asian citrus psyllid. Integrated pest management is a scientifically based strategy to manage the whole ecosystem in such a way as to minimize or eliminate the effects of pests. To learn more, be sure to sign up for our free IPM class on July 24 here!